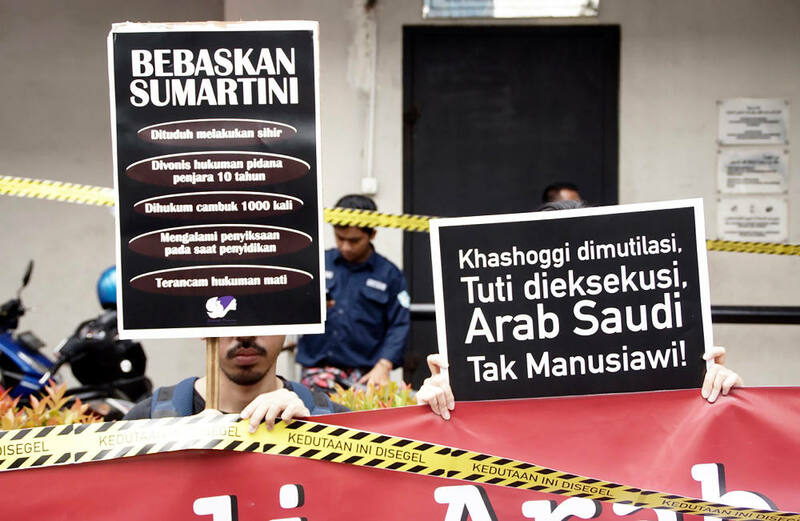 Rights activists carry signs including one that says “Khashoggi was mutilated, Tuti was executed, Saudi Arabia is inhuman,” during a rally outside the Saudi embassy in Jakarta, Nov. 2, 2018. Indonesia’s government announced Friday that it would send 30,000 workers to Saudi Arabia under an agreement signed in October, despite the kingdom’s recent execution of an Indonesian woman convicted of killing her Saudi employer. Indonesia imposed a moratorium on sending workers to Saudi Arabia in 2011 following reports of mistreatment of domestic laborers by their employers. On Oct. 29 Saudi authorities put to death Tuti Tursilawati for killing her employer in 2010, prompting a protest by Indonesian Foreign Minister Retno Marsudi who said her government was not notified in advance. Tuti said she killed her Saudi employer in self-defense because he sexually assaulted her. She then fled but was allegedly raped by nine men in Mecca. Putri Kanesia, an activist with the Commission for Missing Persons and Victims of Violence (KontraS), a local right group, urged the government to cancel the agreement with Saudi Arabia, saying the Saudi government had not shown willingness to uphold universal human rights principles. “We have the rights to be angry with the Saudis, because Tuti had been victimized,” she said. Tuti was the sixth Indonesian worker to be executed for murder in Saudi Arabia since 2008 while another 21 are to be executed, according to Migrant Care, an Indonesian labor protection group. About 700 Indonesians are employed in Saudi Arabia – mostly as domestic helpers, according to officials. Indonesian rights and labor activists have urged the government to scrap the Oct. 11 agreement to send up to 30,000 workers to Saudi Arabia during a six-month trial period, provided their rights are protected in accordance with laws and regulations of both countries. A time frame for the trial period has not been established. On Friday, dozens of rights activists rallied outside the Saudi embassy in Jakarta to protest the execution. Meanwhile, the leader of an agency protecting workers, said the Indonesian government must keep workers safe. “Those are two different things,” Nusron Wahid, head of the National Agency for the Placement and Protection of Indonesian Workers, told BenarNews, referring to the execution and the labor agreement. “The law in Saudi is like that. If someone kills, they will be killed,” Nusron said. Earlier this week, Indonesian Manpower Minister Hanif Dhakiri told local news website KBR that the government was drafting a plan to better protect overseas workers. “Basically, it provides for workers to work for a company instead of individual employers,” he said. Lalu Muhammad Iqbal, the Foreign Ministry’s director for protection of Indonesian citizens, said the Saudis did not have an obligation to notify Indonesia prior to the execution. Only the convict’s heir, the prosecutor and the prison’s chief warder are notified prior to an execution, he said. “In addition, we have not signed a notification agreement with Saudi Arabia,” he said.